When presenting ideas and concepts to colleagues or selling tocustomers, even the best idea can be lost in a poor presentation.Effective Presentation Skills is a ready-to-use training packagethat focuses on learning through experience and one-to-onecoaching. Everything you need to conduct the workshop is here: step-by-stepadministrator's guide, with sample flip charts, program exercises,and evaluation forms, overhead masters, video program with modularexercises, administrator's video instructional guide, comprehensiveparticipant's guide. Give your employees the tools they need to effectively convey theirimportant messages?with Effective Presentation Skills. Bonus! Purchasers receive one year of FREE service fromInternational Training Corporation to ask questions and receivepresentation critiques. 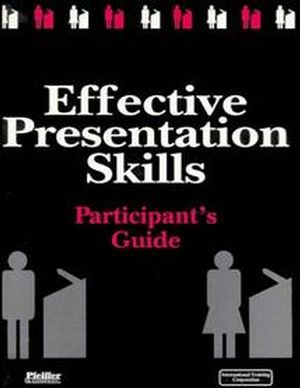 International Training Corporation is the author of Effective Presentation Skills: Video Training Package, published by Wiley. Module 1: Planning The Presentation. Unit 1: The Planning Process. Module 2: Preparing The Presentation. Unit 1: Organizing The Information. Unit 2: Preparing The Presentation Material. Unit 1: Preparing and Using Visual Aids. Unit 2: Using Effective Presentation Skills -- The Basics.